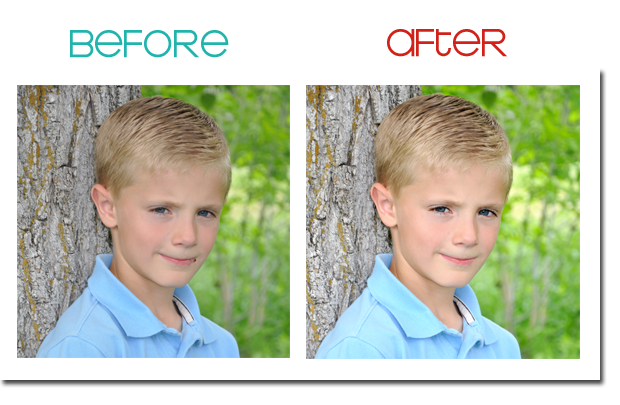 Designer Blogs -- The Blog: New Product: Photo Enhancement! Hi all - Emily here. I am thrilled to talk with you today about our latest offering here at Designer Blogs. We are now doing Photo Enhancements! What are photo enhancements you ask? Well, they are a number of different things - all of which are fantastic! Have you ever had a picture that you would like to use for your blog that you felt was almost usable if only "that stray hair wasn't there" or if "that blemish wasn't there" or if "my teeth were just a bit whiter?' The picture that you use on your blog should be an extension of who you are and we don't want you worrying about whether or not you are putting your best foot forward. Well my friends, no more worries. We can fix that for you. 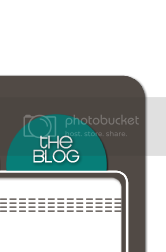 We are now able to touch up your pictures before using them on your blog. I took this picture of my little guy and had the setting on my camera far too orange-ish. He also had a little bump on his forehead and had some rosy cheeks from a cold. After touch-ups, the color of the picture is well-balanced, I've cleared up his blemishes, made his eyes sparkle and evened out his tone to look nice and creamy. Here is a picture I took of my three year old. I actually thought this one was pretty cute on it's own and didn't need any editing. But I thought it might be fun to change the tinting to more of a vintage feel. I've also added a black and white version...just for kicks and giggles. This a picture of my oldest. We had scheduled a family picture day with all of the kids that needed to be done fairly quickly. Much to his dismay, this guy broke out with a fever blister the night before. He was adamant that we switch the picture day. 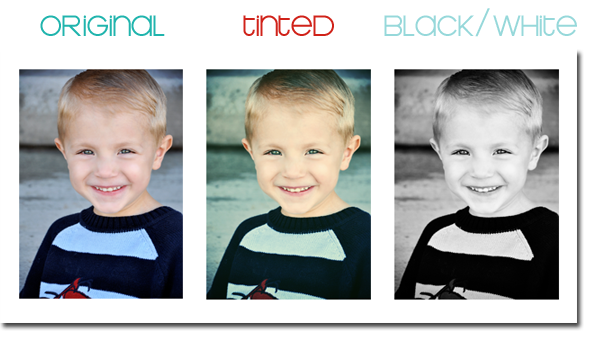 I told him not to worry and to just smile his best because his mama knows how to photoshop. I took the cold sore right out and brightened the pic a bit to make his blue eyes really pop. - Remove your ex from your picture. (Ok, just kidding...unless you had a really bad breakup). If there are other items that you need fixed that aren't listed, just shoot us a quick e-mail and we'd be happy to let you know if we can change them for you. 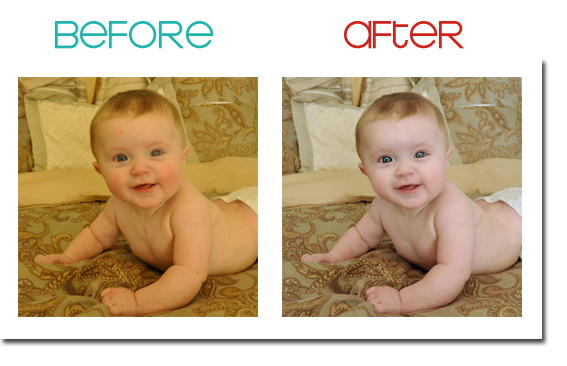 Photo Enhancement will be offered at $5 per picture to be used on your site. If you want an original photo to be touched up and sent back to you for your own printing/keeping purposes the price is $10. Ok - now go take some pictures!